If you’ve been told not to take conflict personally, you only have half the story. Conflict in business and personal relationships can be deeply personal. The key to your freedom is knowing why certain conflicts get their hooks into you, and what you can do to liberate yourself. This is a book about finding that key in order to resolve nagging conflict and prevent inconsequential conflict from cluttering your life. 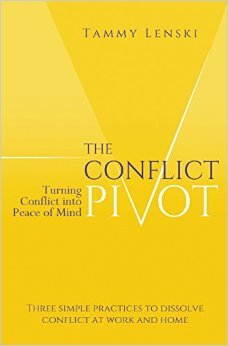 In The Conflict Pivot, veteran mediator, coach, and conflict resolution teacher Tammy Lenski shares the powerful, simplified approach she developed to transform conflict into peace of mind. Now you, too, can pivot away from what keeps you stuck in conflict and toward what will free you from ongoing tension at work or home.